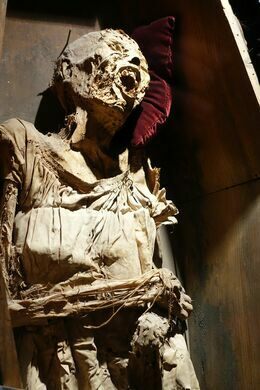 Locations of extreme cold, very dry regions, and bogs are all places in which bodies will naturally mummify, sometimes found thousands of years later. 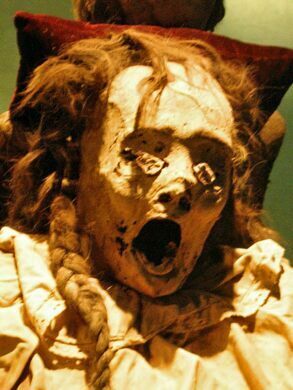 In the case of the Guanajuato mummies, the subjects only had to wait a few hundred years, and were not so much discovered as evicted. From 1865 to 1958, the town of Guanajuato, Mexico, required that relatives pay a grave tax. When the relatives failed to do so for three years in a row, their deceased loved ones were promptly dug up and evicted. 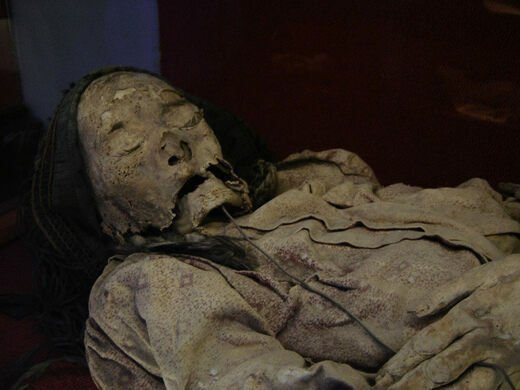 Weirdly, due to the extremely dry conditions of the soil, the corpses often came up as well-preserved mummies. 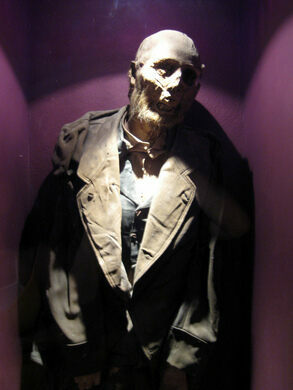 (The first to be dug up and found mummified was one Dr. Remigio Leroy on June 9, 1865.) The cemetery kept these strange mummified corpses underground in an ossuary — actually under the cemetery grounds itself — in case the relatives came around with the money wanting a re-burial. 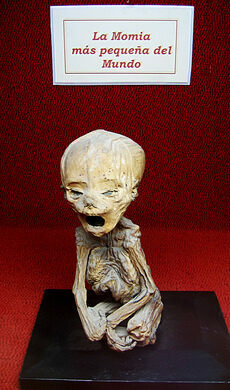 By 1894, the ossuary had racked up enough mummified bodies to rebrand itself as a museum. 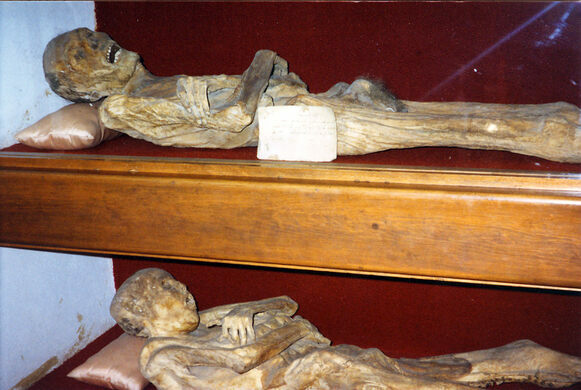 Though the practice ended in 1958 (three years before the first man flew into space), the mummies continued to be kept in the local ossuary/museum. In 1970, a Mexican b-horror movie was produced there called Santo Versus the Mummies of Guanajuato, starring masked wrestler Rodolfo Guzmán Huerta. 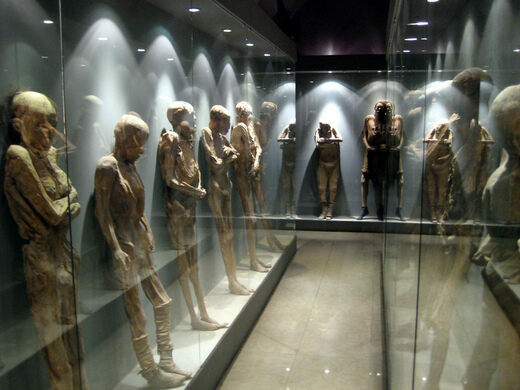 As the mummies gained notoriety, they drew interested visitors. For many years the unfortunate specimens were displayed propped against the walls of the ossuary, but these days they are housed in a more official museum cases. 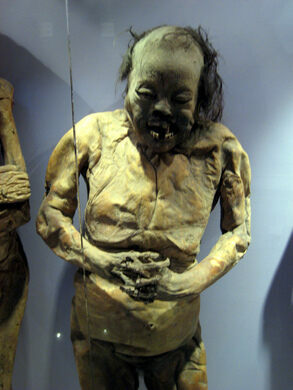 Because they were formed naturally, the mummies are more gruesome-looking than your standard Egyptian mummy. 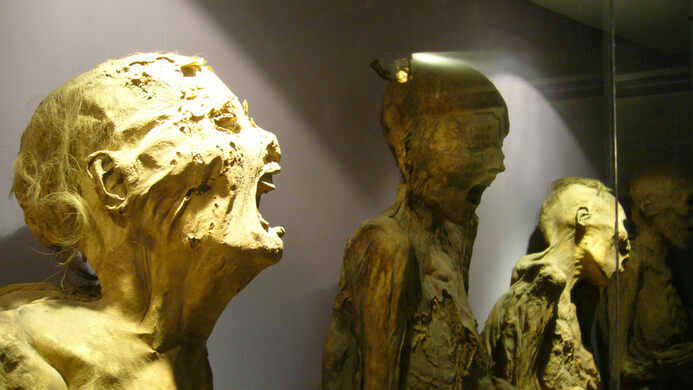 With gaunt and twisted faces, often covered in the tattered rags they were buried in, the mummies stand, lean, and recline in glass cases throughout the museum. 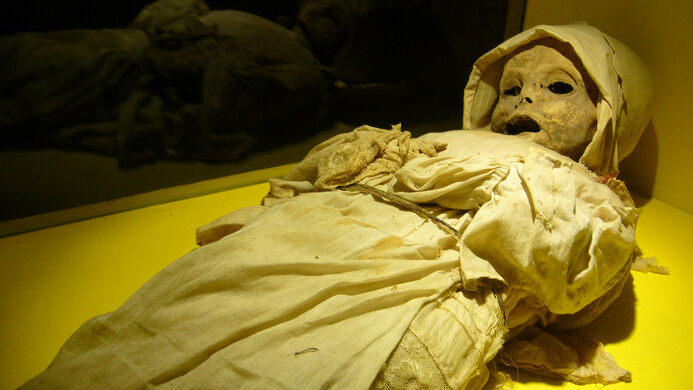 Perhaps the most shocking to visitors are the pregnant mummy and the shrunken child mummies, including “the world’s smallest mummy,” which is no bigger than a loaf of bread. It is still unknown what quality of the soil or the environment of this particular cemetery produces so many natural mummies, and the mystery has given way to many superstitions about them. 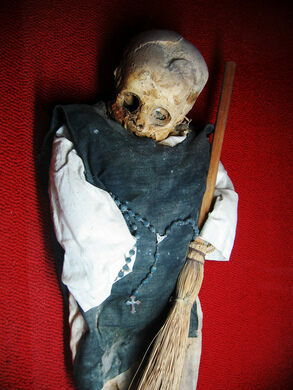 A common local belief is that the mummification is divine punishment for acts committed while alive. 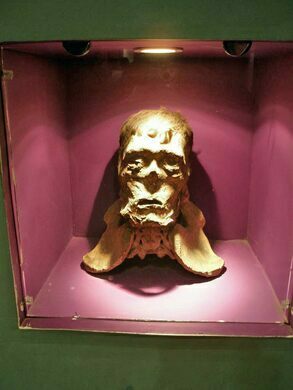 There is a gift shop in the museum that sells sugar skulls and effigies of the mummies, as well as grotesque postcards featuring pictures of the mummies and lowbrow jokes in Spanish. If you take a city bus (marked "Las Momias"), ask the bus driver to point out the street that leads to the museum. You will walk uphill until you see a big stone wall without windows. To go straight to the museum, turn right and follow that wall to its end. Then you will see a lot of souvenir stands. Turn left and walk until you find the ticket window. If you want to visit the cemetery first, do not turn at the big stone wall, but instead, walk uphill just a little more and you will see the entrance to your right. 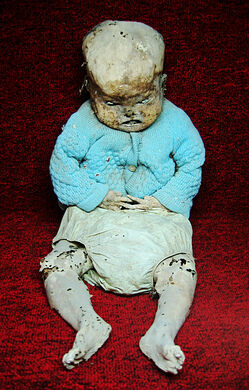 The graveyard is worth a look if you like that kind of thing. You cannot get to the museum from the cemetery. 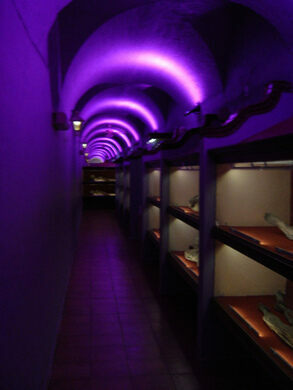 You must walk around to the other side and below—the museum is actually underneath the graveyard! Don't take the short tour or a trip as part of a general tour of the city, as you will not have enough time to appreciate these ghastly cadavers. Instead, make sure you have at least an hour or two to walk around.